Which is healthier and more nutritious - not to mention tastes better - Hamburger or hot dog? Both are popular types of American fast food sandwiches made of particularly shaped ground meat into specific buns, garnished with condiments. A hamburger is a round patty put into round hamburger buns along with condiments; a hot dog is an oblong sausage inside oblong hot dog buns, also with condiments. A sandwich consisting of a cooked patty of ground meat (usually beef but occasionally pork, turkey, or a combination of meats) placed between two round hamburger buns. (Plus the variations). A moist sausage of soft, even texture and flavor (called Frankfurter) often made from meat slurry served in a slice oblong bun called a hot dog bun. Meat patty, two round buns, often served with lettuce, bacon, tomato, onion, pickles, cheese and condiments such as mustard, mayonnaise, ketchup, and relish. Beef sausage in an oblong bun, garnished with mustard, ketchup, onion, mayonnaise, relish, cheese, bacon, chili or saukerkraut. Less expensive hot dogs made from chicken or turkey. A burger can have cheese(making it a cheese burger), bacon, lettuce, pickles, and much more. Hot dogs sold on the streets on carts, at baseball stadiums. 7-Eleven sells the most hot dogs in America nearly 100 million annually. The first printed American menu which listed hamburger was an 1826 menu from Delmonico's in New York. Many claims of the first hot dog including in 1870 on Coney Island and in 1880 on the streets of St.Louis, Missouri. Depends on the fat content of the meat and the cut of meat used. High ammonia levels are present to attain a pH balance of 10 to remove E.Coli and Salmonella. 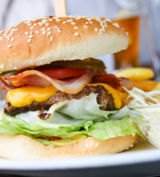 High sodium, fat and nitrite content, ingredients linked to health problems. Named after the city of Hamburg in Germany, from where many emigrated to America. Hamburger in German means someone/something from Hamburg. The term "dog" is used for sausage since 1884 as accusations that sausage makers used dog meat. Per myth, the phrase "hot dog" was coined by cartoonist "TAD" Dorgan in 1900 in a cartoon recording the sale of hot dogs during a NY Giants baseball game. 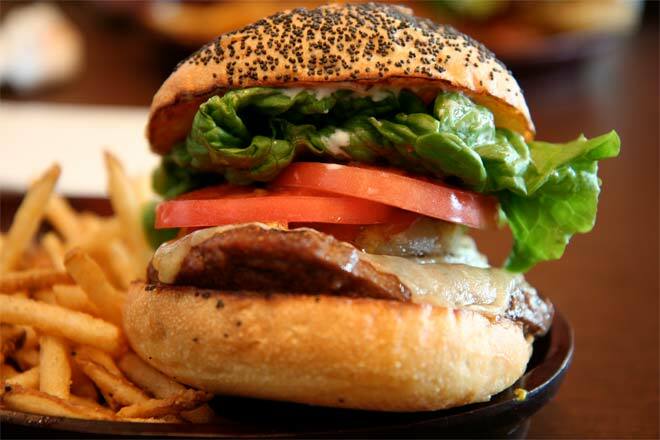 A hamburger has a flat round meat patty in two round buns, often served with lettuce, bacon, tomato, onion, pickles, cheese and condiments such as mustard, mayonnaise, ketchup and relish. A hot dog has a long beef sausage in an oblong bun, garnished with mustard, ketchup, mayonnaise, relish, cheese, bacon, chili or Saukerkraut. Less expensive hot dogs are made from chicken or turkey. Hamburgers and hot dogs, like all other fast foods, are not considered very healthy because of the high fat content. An American Institute for Cancer Research report found that consuming one 50-gram serving of processed meat — about one hot dog — every day increases risk of colorectal cancer by 20 percent. 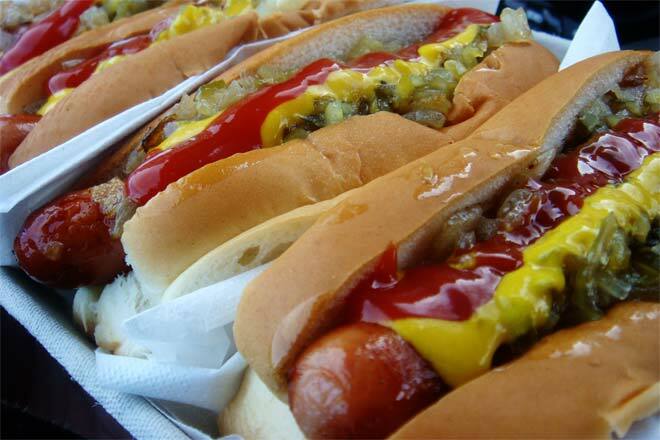 Hot dogs are high in fat and salt and have preservatives sodium nitrate and nitrites, believed to cause cancer. According to the AICR, the average risk of colorectal cancer is 5.8 percent, but 7 percent when a hot dog is consumed daily over years. Famously, Murgon Spurlock's documentary Super Size Me where he eats only McDonald's burgers for 30 days gains 13% body fat. A McDonald's Big Mac typically contains 485 calories and a Quarter Pound with cheese containing 500 calories. Immigrants to the United States from German-speaking countries brought with them some of their favorite foods. One of them was the Hamburg Steak. The Germans simply flavored shredded low-grade beef with regional spices, and both cooked and raw it became a standard meal among the poorer classes. In the seaport town of Hamburg, it acquired the name Hamburg steak. Around 1870, on Coney Island, German immigrant Charles Feltman began selling sausages in rolls. Others have supposedly invented the hot dog. The idea of a hot dog on a bun is ascribed to the wife of a German named Antonoine Feuchtwanger, who sold hot dogs on the streets of St.Louis, Missouri in 1880. Ludwig Feuchtwanger, a Bavarian sausage seller, is said to have served sausages in rolls at the World's Fair either the 1893 World's Columbian Expositio in Chicago or the 1904 Louisiana Purchase Exposition in St Louis, Mussouri.